Achill Island on the Wild Atlantic Way has so many stories to tell! 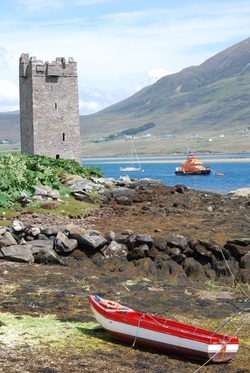 Cil Damhnait Castle is a 15th century tower house associated with the O' Malley Clan, who were once a ruling family of Achill. Grace O' Malley, or Granuaile, the most famous of the O' Malleys was born on Clare Island around 1530. Her father was the chieftain of the barony of Murrisk. The O'Malleys were a powerful sea faring family, who traded widely and refused to submit to English rule. Grace became a fearless leader and gained fame as a sea captain and pirate. She is reputed to have sailed to London to meet with Queen Elizabeth 1 in 1593. The Queen spoke no Irish, and Grace no English, so they conversed in Latin. Grace died around 1603 and is buried in the O'Malley family tomb on Clare Island. Achill Island has a long history of human settlement and there is evidence that it was inhabited more than 5,000 years ago. Megalithic tombs and promontory forts can be seen at Slievemore, along the Atlantic Drive and on Achill Beg Island. Kildavnet, on the south east coast of Achill is named after St. Damhnait, or Dymphna, who founded a church there in the 16th century. There is also a holy well just outside the graveyard. The present church was built in the 1700's and the graveyard contains memorials to the victims of two of Achill's greatest tragedies, the Kirkintilloch Fire (1937) and the Clew Bay Drowning (1894). 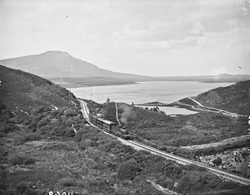 In 1894 the Westport - Newport railway line was extended to Achill Sound. The train provided a great service to Achill, but it also fulfilled an ancient prophecy. Brian Rua O' Cearbhain had prophesied that 'carts on iron wheels' would carry bodies into Achill on their first and last journey. 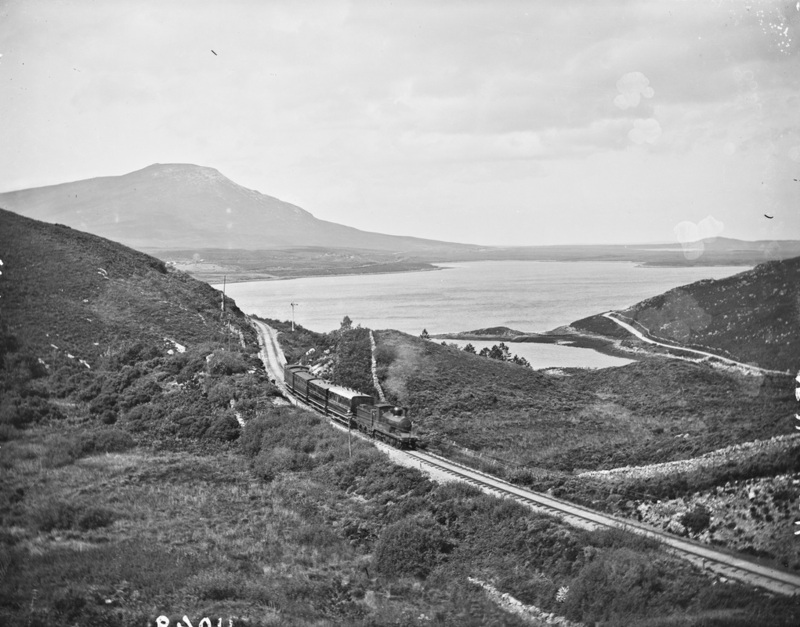 In 1894, the first train on the Achill railway carried the bodies of victims of the Clew Bay Drowning, which occurred when a boat overturned in Clew Bay, drowning thirty two young people. They had been going to meet the steamer which would take them to Scotland for potato picking. The Kirkintilloch Fire Disaster in 1937 fulfilled the second part of the prophecy when the bodies of ten victims were carried by rail to Achill. These young men had died in a fire in a 'bothy', temporary accommodation provided in farm buildings for those who went to Scotland to pick potatoes. Young people from Achill Island spent their summers working in Scotland right up until the 1960s. Nowadays, most of the young people of Achill continue into third-level education around Ireland. They often gain employment in modern high tech companies in Ireland and abroad, though many of them have had to emigrate to find work in the past few years, as history repeats itself. This old railway line is now the Great Western Greenway. At the base of Slievemore mountain lies the Deserted Village, containing more than 80 ruined houses. The houses were built of un-mortared stone, and each consisted of just one room. This room was used as kitchen, living room, bedroom and even stable, as the cow was kept indoors at night tethered to a ring at one end. She was a type of central heating, and a channel dug into the earthen floor carried her waste to a tank outside the door for used as fertiliser. In Achill, as in many areas of Ireland, a system called 'Rundale' was used for farming. This meant that the land around a village was rented from a landlord. This land was then shared by all the villagers to graze their cattle and sheep. Each family would then have two or three small pieces of land scattered about the village, which they used to grow crops. In the fields around the Deserted Village and up on the mountain the tracks of 'lazy beds' where crops like potatoes were grown can still be seen. For many years people lived in the village and then in 1845 Famine struck in Achill as it did in the rest of Ireland. Most of the families moved to the nearby village of Dooagh, which is beside the sea, while some others emigrated. Living beside the sea meant that fish and shellfish could be used for food. The village was completely abandoned, leading to it being called the 'Deserted Village'. Though no one has lived full-time in these houses since the time of the Famine, the families that moved to Dooagh and their descendants continued to use the village as a 'booley village'. During the summer season the younger members of the family would take the cattle to graze on the hillside and they would stay in the houses. This custom continued until the 1940's. Boolying was also carried out in other areas of Achill, including Annagh on Croaghaun mountain and in Corraun. This practice is known as 'transhumance'. 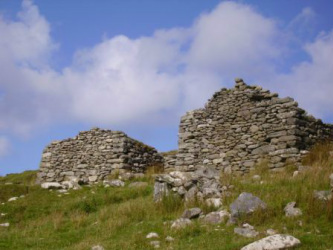 At Ailt, Kildownet, you can see the remains of a similar deserted village. This village was deserted in 1855 when the tenants were evicted by the local landlord so the land could be used for cattle grazing, the tenants were forced to rent holdings in Currane, Dooega and Slievemore and some of them emigrated to America. 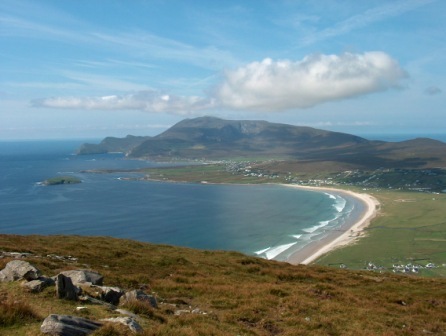 Achill Island boasts some of the finest beaches in Ireland, including five Blue Flag beaches. The Blue Flag scheme is an international standard for beaches and marinas and is assessed on an annual basis. The criteria for qualification include water quality, environmental education, environmental management, and safety and services, and became even more stringent in 2013. In Ireland the Blue Flag scheme is administered by An Taisce, the national body for heritage and the environment. Full details of the Blue Flag beaches standard can also be found at BlueFlag.org.